Here is a wonderful side dish that celebrates some of my favorite flavors – fresh sugar snap peas, sauteed until they start to brown , adding heat from using rounds of thai red chiles cooled by the use of some fresh chopped mint! It’s a perfect dish and simple to prepare. Enjoy! From by the bay, wishing you sugar snap food memories! In a medium saute pan heat the olive oil, when it’s hot carefully add the sugar snap peas to the pan. Cook , stirring the sugar snap peas . When the peas start to soften add the thai chile and continue to saute until the sugar snap peas start to char and brown in places. Add sea salt and pepper to taste. Place in serving bowl and sprinkle with fresh mint. 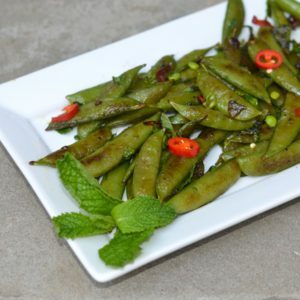 This entry was posted in side dish and tagged charred spicy sugar snap peas, mint recipes, spring recipes, spring vegetables, thai red chile, vegetarian recipes on June 2, 2016 by entertainingbythebay.